Have you realized that your rental is not making the kind of revenue you hoped for? Check out this video and learn how short-term rentals can dramatically improve your situation. This is YOUR chance to be part of the revolution that’s changing the face of the rental industry FOREVER! All these things take the fun out of the business and cause many landlords to quit. Airbnb for Landlords 2.0 allows you to have the exact opposite experience! Airbnb for Landlords 2.0 is a powerful coaching and training program that shows you how to create a profitable short–term rental and how to serve travelers with hotel–sized budgets. It has given some landlords the means to build wealth and settle into retirement. But the demand for short-term rentals by HIGH PAYING GUESTS has reached an all-time high. And we know you NEED to know about this opportunity to get ahead as your expenses and earn a lot more cash flow. Al Williamson has been an Airbnb guest and host since 2012. He started using the online travel agency while on long-term assignments as a construction manager. Over the years, Al watched the industry mature and has interviewed countless hosts. This is how Al discovered landlords banked the most money when they compete against extended stay hotels. Al created a plan and put his own rentals in an “extended-stay mode.” He made mistakes, refined his systems, and went on to earn enough to leave his civil engineering job. Since he unveiled the Airbnb for Landlords course at the Mr. Landlord Retreat in 2016, Al has helped over 200 landlords start short-term rental businesses. Some of his students now earn 5 to 10 times more than they did as conventional landlords. How awesome is that? Are you still wondering if this is the best fit for you? Bonus 4 – Hard Copy of All Material – The four modules will be mailed on a flash drive. You don’t need the internet to watch them! The strategy guide, workbook, and lessons will be sent to you as a booklet so you can mark it up at your leisure. Bonus 5 – The Book: 40 Ways to Increase the Net Income of Your Rental Property – The first and most complete collection of ancillary income ideas for landlords. If you don’t save time with this structured approach to analyzing your local market and if you don’t find the checklists and ready-to-implement systems to be worth more than you paid for, then you deserve your money back. No questions asked – no games. ARE YOU TRULY READY FOR TAKEOFF? … And say goodbye to the days of being a cash-strapped landlord! Make the most of your assets.�Take action today! 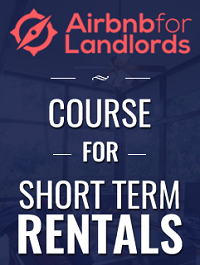 Sign up for the Mr. Landlord version of the Airbnb for Landlords 2.0 course for only $497. To get started, click on the “Add to My Cart” button now.